· “Scientist” featured in No Script produced by Bleacher Report with Marshawn Lynch. Office: Bigelow Physics Building Room 136 (BPB-136). Ph.D. in Experimental Condensed Matter Physics (1998) from Harvard University. Thesis title: "NMR experiments in a diamond anvil cell at high pressures." 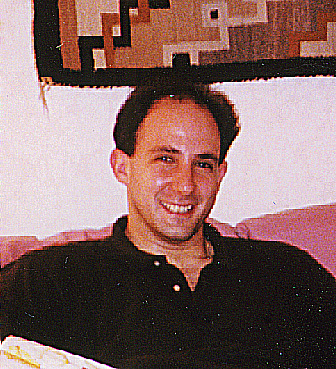 A.M. in Physics (1990) from Harvard University. B.Sc. in Physics and Applied Mathematics (1988) with honors from the California Institute of Technology (Caltech). Steven Brant (UNLV Physics major) working on his senior thesis. Some of my former staff and students can be found here: Former staff and students. My primary research interests are three-pronged: 1. study of molecular/organic crystals (including energetic materials) under extreme conditions of high pressure, high temperature, and/or ionizing radiation using Raman, infrared (IR), and X-ray spectroscopic methods; 2. investigation of actinide and lanthanide metals at high pressure using X-ray spectroscopic methods; and 3. efforts to demonstrate the validity of Ion Beam Nuclear Transmutation Doping (IBNTD) method for the doping of Wide Band Gap Semiconductors using Raman, micro-Raman, electrical (e.g. Hall effect), X-ray, and Photoluminescence methods. We have developed and constructed cryogenic facilities to enable easy loading of low melting temperature solids and have recently loaded liquid oxygen. We have performed experiments at the Advanced Photon Source, National Synchrotron Light Source, Advanced Light Source, the European Sychrotron Radiation Facility, the Pohang Light Source and the Canadian Light Source. Recently, I have opened up a new field of science that I call useful hard x-ray induced chemistry where I use the highly ionizing, highly focused, and highly penetrating properties of hard x-rays (>7 keV) to initiate novel and highly controlled chemistry in situ in isolated and/or pressurized chambers. Though x-ray induced damage of various materials has been known as a nuisance for decades, we are using these decomposition reactions to develop novel and useful chemistry under extreme or isolated conditions. I have published a number of seminal papers on this new field of science which are listed in my publications below. Most recently, we have synthesized a doped and very stable form of polymeric carbon monoxide by irradiating and pressurizing a benign starting material without the need for complex cryogenic loading of toxic carbon monoxide. We are excited as we feel that this is the first time anyone has ever synthesized a polymer with a combination of x-rays and high pressure which may even lend insight into how complex molecules such as DNA were formed via energizing radiation in the deepest reaches of outer space. We have used these methods to synthesize novel materials such as doped polymeric carbon monoxide and a novel structure of cesium superoxide demonstrating that not only can x-ray synthesize novel compounds, they can create novel structures of known compounds. 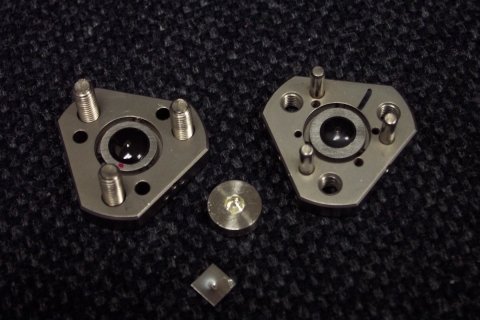 Using our irradiation methods, we have also successfully released molecular fluorine inside sealed chambers such as a diamond anvil cell by loading samples with fluorine-bearing compounds such as C6F14 and KBF4. This has enabled us to develop fluorine chemistry at extreme conditions. Doped polymeric carbon monoxide (poly-CO) created via useful hard x-ray photochemistry. · "High pressure behavior of mercury difluoride (HgF2)," S. Schyck, E. Evlyukhin, E. Kim, M. Pravica, Chemical Physics Letters 724, pp 35-41 (2019). · “Hard x-ray induced synthesis of OF2” M. Pravica, M. White, Y. Wang, Y. Xiao, P. Chow, 36(4), pp. 50-52, Chimica Oggi (2018). · “Forcing Cesium into Higher Oxidation States Using Useful Hard X-ray Induced Photochemistry at Extreme Conditions,” D. Sneed, M. Pravica. E. Kim, N. Chen, C. Park, M. White IOP Conf. Series: Journal of Physics: Conf. Series 950 (2017) 042055. · Editor’s Choice: “X-ray induced synthesis of stable doped solid CO at ambient conditions,” M. Pravica, E. Evlyukhin, P. Cifligu, B. Harris, N. Chen, Y. Wang, Chemical Physics Letters 686, pp. 183-188 (2017). · “Inner-shell Chemistry under High Pressure,” M. Miao, J. Botana, M. Pravica, D. Sneed, C. Park, Japanese Journal of Applied Physics 56 05FA10 (2017). · “High Pressure Resonant X-ray Emission Studies of WO3 and Hydrogenated WO3,” M. Pravica. Y. Wang, Y. Xiao, P. Chow, Japanese Journal of Applied Physics Conference Proceedings 6, 011102 (2017). · “High-Pressure Equation of State of Cesium Fluoride to 120 GPa,” D. Sneed, M. Pravica, E. Kim, P. Weck, Japanese Journal of Applied Physics Conference Proceedings 6, 011101 (2017). · “A novel method to create molecular mixtures at high pressures: The case of fluorine and oxygen,” M. Pravica, M. White and Y. Wang, Shock Compression of Condensed Matter 2015- AIP Conference Proceedings, 1793, pp. 060030:1–4 (2017). · “WHEN DO SCIENTIFIC EXPLANATIONS COMPETE? STEPS TOWARD A HEURISTIC CHECKLIST,” Metaphilosophy, T. Jones and M. Pravica, 48 (1-2) pp. 96-122 (2017). · “Why do I need to take physics?” M. Pravica, The National Teaching & Learning Forum, 25 (5), pp. 8-9 (2016). · “High Pressure Studies of KClO4,” M. Pravica, Y. Wang, D. Sneed, S, Reiser, M. White, Chemical Physics Letters, 660, pp. 37-42 (2016). · “Giant Pressure-Driven Lattice Collapse Coupled with Intermetallic Bonding and Spin-State Transition in Manganese Chalcogenides”, Y. Wang, L. Bai, T. Wen, L. Yang, H. Gou, Y. Xiao, P. Chow, M. Pravica, W. Yang, Y. Zhao, Angewandte Chemie 128, pp. 10506-10509 (2016). · “Reversible switching between pressure-induced amorphization and thermal-driven recrystallization in VO2(B) nanosheets,” Y. Wang, J. Zhu, W. Yang, T. Wen, M. Pravica, Z. Liu, M. Hou, Y. Fei, L. Kang, Z. Lin, C. Jin, Y. Zhao, Nature Communications 7, 12214 (2016). · “A novel synthesis of polymeric CO via useful hard x-ray photochemistry,” M. Pravica, D. Sneed, Q. Smith, B. Billinghurst, T. May, M. White, Cogent Physics 3, (2016). · “Robust high pressure stability and negative thermal expansion in sodium-rich antiperovskites Na3OBr and Na4OI2,” Y. Wang, T. Wen, C. Park, C. Kenny-Benson4, M. Pravica, W. Yang and Y. Zhao, Journal of Applied Physics, 119, 025901 (2016). · “Pressure-induced cation-cation bonding in V2O3,” L. Bai, Q. Li, S. Corr, M. Pravica, C. Chen, Y. Zhao, S. Sinogeikin, Y. Meng, C. Park, and G. Shen, Physical Review B 92, 134106 (2015). J. Paladugu, M. Pravica, C. Chen, A. Cornelius, Y. Zhao, Journal of Alloys and Compounds 643, pp. 186–194 (2015). · “Communication: A novel for generating molecular mixtures at extreme conditions,” M. Pravica, D. Sneed, M. White and Y. Wang, Journal of Chemical Physics 141, 091101 (2014); http://dx.doi.org/10.1063/1.4894402. · “Novel method for producing molecular fluorine,” M. Pravica, D. Sneed, M. White and Y. Wang, Review of Scientific Instruments, 85, 086110 (2014); http://dx.doi.org/10.1063/1.4893384 (2014). · “Carbon tetrachloride under extreme conditions,” M. Pravica, D. Sneed, Y. Wang, Q. Smith and G. Subrahmanyam, Journal of Chemical Physics 140, 194503 (2014). · “Studies in useful hard x-ray induced chemistry: Potassium Halates under extreme conditions,” M. Pravica, B. Hulsey, L. Bai, and D. Sneed, Q. Smith and G. Guardala, 18th APS-SCCM and 24th AIRAPTJournal of Physics: Conference Series 500, 022009 (2014). · “X-ray induced mobility of molecular oxygen at extreme conditions” M. Pravica, D. Popov, S. Sinogeikin, D. Sneed, G. Guardala, Q. Smith, Applied Physics Letters, 103, 224103 (2013). · “High pressure x-ray photochemical studies of carbon tetrachloride: Cl2 production and segregation,” M. Pravica, D. Sneed, Q. Smith, L. Bai, Chemical Physics Letters 530, pp. 74-76 (2013). · “Measurement of the Energy Dependence of X-ray Induced Decomposition of Potassium Chlorate,” M. Pravica, D. Sneed, L. Bai, C. Park, Journal of Physical Chemistry, 117, 2302-2306 (2013). · “High pressure investigations of Melamine,” M. Galley, M. Pravica, Z. Liu, High Pressure Research 33 (1), pp. 40 – 54 (2013). · “High Pressure Infrared and X-ray Raman Studies of Aluminum Nitride,” M. Pravica, N. Bhattacharya, Y. Liu, J.Robinson, W. Au, T. Mizoguchi, Z. Liu, Y. Xiao, Physica Status Solidi B, 1-6, DOI 10.1002/pssb.201200485 (2013). · “Hydrazine at High Pressures,” M. Pravica, Y. Liu, L. Bai, Chemical Physics Letters, 555, pp. 113-115 (2013). · “1,1-Diamino-2,2-Dinitroethylene Under High Pressure-Temperature,” M. Bishop, R. Chellappa, M. Pravica, J. Coe, Z. Liu, D. Dattelbaum, Y. Vohra, and N. Velisavljevic, Journal of Chemical Physics 137, 174304 (2012). · “Charge transfer in spinel Co3O4 at high pressures.” L. Bai, M. Pravica, Y. Zhao, C. Park, Y. Meng, S. Sinogeikin and G. Shen, Journal of Physics: Condensed Matter 24, 435401 (2012). · “A High-Pressure Far- and Mid-Infrared study of 1,1-Diamino-2,2-dinitroethylene,” M. Pravica, Y. Liu, J. Robinson, N. Velisavljevic, Z. Liu, Journal of Applied Physics, 111, 103534 (2012). · “Experiments in hard x-ray chemistry: In situ production of molecular hydrogen and x-ray induced combustion,” M. Pravica, et al., Review of Scientific Instruments 83, 036102 (2012). · “A novel method for in situ loading of gases via x-ray induced chemistry,” M. Pravica, et al., Review of Scientific Instruments, 82, 106102 (2011). · “High Pressure X-ray Diffraction Study of Potassium Chlorate,” M. Pravica, L. Bai, N. Bhattacharya, Journal of Applied Crystallography, 45, pp. 48-52 (2012). · “In-situ synchrotron x-ray study of phase transitions in melamine under high pressures and high temperatures," M. Pravica, M. Galley,C. Park, H. Ruiz, J. Wojno, Diamond and Related Materials 20 (7):1090-1092 (2011). · “A Far- and Mid- Infrared Study of HMX (octahydro- 1,3,5,7-tetranitro-1,3,5,7-tetrazocine) under High Pressure,” M. Pravica, M. Galley, E. Kim, P. Weck, and Z. Liu, Chemical Physics Letters 500, pp. 28-34 (2010). · “A High Pressure, High Temperature Study of 1,1 Diamino–2,2 Dinitro ethylene.,” M. Pravica, M. Galley, C. Park, H. Ruiz and J. Wojno, High Pressure Research EHPRG 2010 conference proceedings, pp. 1-6 (2010). · “High Pressure Studies of Melamine,” M. Pravica, E. Kim, S. Tkachev, P. Chow, and Y. Xiao, High Pressure Research EHPRG 2009 conference proceedings, 30 (1), pp. 65-71 (2010). · “High pressure infrared study of 1,3,5,7-cyclooctatetraene (COT),” M. Pravica, E. Romano, S. Tkachev and Z. Liu, Joint AIRAPT & HPCJ-50, Journal of Physics: Conferences Series 215, 012050 (2010). · “High-pressure far- and mid-infrared study of 1,3,5,7 Triaminotrinitrobenzene,” M. Pravica, B. Yulga, S. Tkachev and Z. Liu, Journal of Physical Chemistry A, 113 (32), pp. 9133-9137 (2009). · “Raman spectroscopic study of cyclopentane at high pressure,” S. Tkachev, M. Pravica, E. Kim and P. Weck, Journal of Chemical Physics, 130, 204505 (2009). · “Organic Cyclic Difluoramino-nitramines: Infrared and Raman Spectroscopy of 3,3,7,7 tetrakis(difluoramino)octahydro 1,5-dinitro-1,5-diazocine (HNFX),” P. F. Weck, E. Kim, C. Gobin and M.G. Pravica, Journal of Raman Spectroscopy, 40, pp. 964-971 (2009). · “A novel method to dope diamond - Ion Beam Nuclear Transmutation Doping (IBNTD),” M.G. Pravica, N.A. Guardala and J.L. Price, Diamond and Related Materials, 18, pp. 846-849 (2009). · “High Pressure Studies of 1,3,5,7 Cyclooctatetraene: Experiment and Theory,” S. Tkachev, M. Pravica, E. Kim, E. Romano and P. Weck, Journal of Physical Chemistry A, 112, pp. 11501-11507 (2008). · “Radiation-induced decomposition of PETN and TATB under extreme conditions,” H. Giefers and M. Pravica, Journal of Physical Chemistry A, 112 (15), pp. 3352-3359 (2008). · “Radiation-induced decomposition of explosives under extreme conditions,” H. Giefers, M. Pravica, W. Yang and P. Liermann, SMEC 2007 conference proceedings, Journal of Physics and Chemistry of Solids, 69, pp. 2208-2218 (2008). · “Anisotropic decomposition of energetic materials,” M. Pravica et al., APS Shock Compression of Condensed Matter (SCCM) Conference Proceedings CP955 (2007). · “X-ray Raman Spectroscopic Study of Benzene at High Pressure,” M. Pravica, O. Grubor-Urosevic, M. Hu, P. Chow and P. Liermann, Journal of Physical Chemistry B LETTERS, 111(40), pp. 11635-11637 (2007). · “Structural transition of PETN-I to a ferroelastic orthorhombic phase PETN-III at elevated pressures,” O.Tschauner, B. Kiefer, Y. Lee, M. Pravica, M. Nicol and E. Kim, Journal of Chemical Physics, 127, 094502 (2007). · "An Infrared Study of TATB under High Pressure," M. Pravica, B. Yulga, Z. Liu and O. Tschauner, Physical Review B, 76, 064102 (2007). · “Phonon Density of States of Metallic Sn at High Pressure,” H. Giefers et al., Physical Review Letters, 98, 245502 (2007). · “High Pressure Studies of Cyclohexane to 40 GPa,” M. Pravica, YR Shen+, Z. Quine, E. Romano and D. Hartnett, Journal of Physical Chemistry B, 111, 4103-4108 (2007). · “X-ray Raman Studies on C60 fullerenes and multi-walled carbon nanotubes under pressure,” R. Kumar, M. Pravica, A. Cornelius, M. Nicol, M. Hu and P. Chow, Diamond and Related Materials, 16, 1250-1253 (2007). · “X-ray diffraction study of elemental thulium at pressures up to 86 GPa,” M. Pravica, Z. Quine, E. Romano, Physical Review B, 74, 104107 (2006). · "Radiation-induced decomposition of PETN and TATB under pressure," H. Giefers, M. Pravica, P. Liermann and W. Yang, Chemical Physics Letters, 429, pp. 304-309 (2006). · "Studies of phase transitions in PETN at high pressures," M. Pravica et al., Journal of Physics and Chemistry of Solids, 67, pp. 2072-2076 (2006). · "X-ray diffraction study of elemental erbium to 70 GPa," M. Pravica, E. Romano and Z. Quine, Physical Review B, 72, 214122 (2005). · "Raman Scattering Studies of the High-Pressure Stability of Pentaerythritol Tetranitrate, C(CH2ONO2)4," K.Lipinska-Kalita, M.G. Pravica and M. Nicol, Journal of Physical Chemistry B, 109 (41), 19223-19227 (2005). · “Characteristics of Silicone Fluid as a Pressure Transmitting Medium in diamond anvil cells,” YR Shen, R. Kumar, M.G. Pravica and M. Nicol, Review of Scientific Instruments, 75 (11), pp. 4450 – 4454 (2004). · “High Pressure Raman Spectroscopic Study of Structural Polymorphism in Cyclohexane,” M.G. Pravica, YR. Shen and M.F. Nicol, Applied Physics Letters, 84 (26), pp. 5452-5454 (2004). 3. “A novel synthetic route for polymers utilizing hard x-ray photochemistry” (Patent: WO 2018034650). · Invited talk: “Novel synthesis under extreme conditions,” UNLV, Las Vegas, NV (3/20/19). · Supervised over 6 students from Southeast Career Technical Academy (SECTA) to perform Raman spectroscopic experiments on soil and water samples from the Moapa reservation (12/19/18). · Supervised over 50 students from various local Las Vegas high schools including Southeast Career Technical Academy (SECTA) to collect and perform experiments on soil and water samples in the Moapa reservation (11/17/18). · Contributed talk entitled:”How to we teach our students science and science activism?” to the National Collegiate Honors Council Conference, Boston, MA (11/10/18). · Invited panelist: “Identifying Grants and Writing Proposals,” UNLV 10/9/18. · Invited talk to the Army Research Laboratory entitled: “X-ray induced synthesis of a novel material: Doped Polymeric Carbon Monoxide,” Aberdeen, MD (8/20/18). · Invited talk entitled: “From here to the eternities…” to the Nativity of the Most Holy Theotokos Serbian Orthodox Mission (6/3/18). · Invited talk entitled: “Harnessing hard x-rays to drive novel science” to the Institute of Physics, Belgrade Serbia (5/25/18). · Invited talk entitled: “Harnessing hard x-rays to drive novel science” to California State University Northridge (5/17/18). · Invited talk on climate change to Bishop Gorman High School, Las Vegas, NV (3/6/18). · Invited panelist for the Tenure and Promotion Forum at UNLV, Las Vegas, NV (10/26/17). · Invited panelist for the Science of Climate Change at the Global Climate Change Summit at University of Nevada, Reno. Presented a brief lecture entitled: “Can we change our atmosphere?” Reno, NV (9/23/17). · Invited talk to the Somerset Academy entitled: “Novel chemistry under extreme conditions,” Henderson, NV (9/21/17). · Contributed talk to the International Research Conference on Sustainable Energy, Engineering, Materials and Environment entitled: “Synthesis of novel materials via hard x-ray photochemistry,” Newcastle, UK (7/27/17). · Contributed talk to the 16th European Conference on Solid State Chemistry entitled: “Synthesis of novel materials via hard x-ray photochemistry,” Glasgow, UK (7/24/17). · Invited talk entitled: “Driving novel chemistry with hard x-rays” for the High Pressure Special Interest Group, Argonne, IL (4/21/17). · Invited to present physics of sound, Tesla coil, and optical spectroscopy demonstrations for “Science Night” at Bob Miller Middle School, Henderson NV (3/23/17). · Contributed talk given at the American Physical Society March meeting entitled: “Synthesis of novel materials via useful hard x-ray photochemistry,” New Orleans, LA (3/16/17). · Invited talk entitled: “Studies in useful hard x-ray photochemistry” for the Advanced Photon Source User Science Seminar Series, Argonne, IL (3/3/17). · Invited talk on climate change to Bishop Gorman High School, Las Vegas, NV (1/24/17). · Presented UNLV Forum talk entitled: "Wave phenomena and mechanisms of creativity," Las Vegas, NV (12/2/16). · Invited talk and demonstration entitled: “Nikola Tesla’s contributions to modern science” to the ETF BAFA 15th Anniversary Celebrations/160th Nikola Tesla Anniversary in San Francisco, CA (11/5/16). · Invited talk and demonstration entitled: “Who was Nikola Tesla?” to the St. Petka Serbian Orthodox Church in San Marcos, CA (9/17/16). · Contributed talk given at the HPSP 17 meeting entitled: “Equation of State of Cesium Fluoride to 115 GPa and Possible Observation of CsF2,” and contributed poster entitled: “High Pressure Resonant X-ray Emission Studies of WO3 and Hydrogenated WO3,” University of Tokyo, Japan (2/18/16). · Invited talk entitled: “The mysterious and brilliant Nikola Tesla,” at the FreedomFest Conference held at Planet Hollywood, Las Vegas, NV (7/15/16). · Invited “star witness” for a mock trial on climate change at the FreedomFest Conference held at Planet Hollywood, Las Vegas, NV (7/14/16). · Invited talk entitled: “Who was Nikola Tesla?” to the St. Sava Serbian Orthodox Church in Edmonton, Alberta (6/25/16). · Panelist (one of two) for a discussion entitled: “Teaching Large Classes,” organized by the UNLV Graduate College (4/1/16). · Contributed talk given at the 2016 Stewardship Science Academic Programs (SSAP) Symposium entitled: “A Novel Synthesis of Polymeric CO via Useful Hard X-ray Photochemistry,” North Bethesda, MD (2/18/16). · Invited talks entitled: “Who was Nikola Tesla?” to the St. Sava Serbian Orthodox Church in Phoenix, AZ (11/7/15 – 11/8/15). · Invited talk entitled: "Novel fluorine chemistry under extreme conditions using useful hard x-ray photochemistry," IUCR High Pressure Workshop, Campinas, Brazil (9/15/15). · Contributed talk to the APS SCCM conference entitled: “A novel method to create molecular mixtures at high pressures,” Tampa, FL (6/16/15). · Invited moderator for the session entitled: “Climate Change: Impacts On and Responses from the Insurance Industry,” Refocus 2015 Conference, Las Vegas, NV (3/4/15). · Invited guest lecturer for UNLV Hospitality Facilities Management class "Why is physics so important to society?" UNLV (2/2/15). · Videotaped interview with Dr. James Rhem and Prof. Maria Jerinic-Pravica,”Conversations with Teaching Academy Fellows,” UNLV December 5, 2014. Link: https://www.youtube.com/watch?v=_MqHnYRSaIE&feature=youtu.be . · Invited UNLV University Forum talk entitled: “Global climate change: What’s going on?” December 3, 2014. · Invited talk entitled: “What is energy?” to Mr. Ralph’s and Ms. Pam’s classes at the Silver Sands Montessori Charter School in Henderson, NV (9/26/14). · Contributed talk to the HPSP-16 conference entitled: “Studies of gallium nitride at high pressure,” Mexico City, MX (8/8/14). · Invited talk on Nikola Tesla to the St. George Serbian Orthodox Church in San Diego, CA (6/29/14). · Invited talk entitled: “Physics of the Atom” to Ms. Jane’s class at the Silver Sands Montessori in Henderson, NV 3/23/14). · Invited talk entitled: “Physics of Sound” to Ms. Jane’s class at the Silver Sands Montessori in Henderson, NV (2/7/14). · Invited panelist to the Second Annual STEM Summit at UNLV: “Minorities in STEM and Health Sciences,” UNLV, Las Vegas, NV (1/14/14). · Two invited talks entitled: “The physics of sound” and “The exciting world of science at extreme conditions,” to 7th and 8th graders (respectively) at the Kennedy Junior High School, Lisle, IL(12/16/13). · Invited talk entitled: “What is gravity?” to Ms. Jane’s class at the Silver Sands Montessori, Henderson, NV (12/12/13). · Invited talk entitled: “The physics of sound” to the Science Club at the K.O. Knudsen Middle School, Las Vegas, NV (12/3/13). · Invited keynote talk/presentation for the “Diocesan Days” celebration of the Western Diocese of the Serbian Orthodox Church in North America: “The Incredible contributions of Nikola Tesla,” Alhambra, CA (8/31/13). · Presented poster entitled “Studies in useful hard x-ray induced chemistry” at the American Crystallography Association (ACA) meeting in Honolulu, HI (7/13). · Contributed talk to the joint AIRAPT/APSSCCM conference entitled: “Studies in useful hard x-ray induced chemistry,” Seattle, WA (7/11/13). · Invited plenary lecture entitled: “Novel means of chemical nanosynthesis via useful hard X-ray induced chemistry,” for the SIXTH INTERNATIONAL CONFERENCE OF CONTEMPORARY MATERIALS,” Academy of Arts and Sciences, Republika Srpska, Banja Luka, Bosnia-Hercegovina (7/5/13). · Invited plenary lecture entitled: “The Incredible Contributions of Nikola Tesla” for the American Association for the Advancement of Science (AAAS) Pacific Division meeting at the University of Nevada, Las Vegas (6/19/13). · Invited talk entitled: “Experiments of energetic and other materials subjected to extreme conditions using far- and mid-IR spectroscopies,” Canadian Light Source, University of Saskatchewan, Canada (6/12/13). · Invited talk entitled: “Studies in useful hard x-ray chemistry,” to the Canadian Society of Chemistry in Quebec City, Quebec, Canada (5/29/13). · Invited talk entitled: “Who Was Nikola Tesla?” to the St. Basil of Ostrog Serbian Orthodox Church in Lake Forest, IL (4/7/13) as part of their “Nikola Tesla Day” celebrations. · Invited talk entitled: “The Exciting World of Science at Extreme Conditions” to Mr. Ralph’s middle class at the Silver Sands Montessori in Henderson, NV (3/15/13). · Invited talk entitled: “The physics of sound” to the Science Club at the K.O. Knudsen Middle School, Las Vegas, NV (12/11/12). · Presented a UNLV University Forum lecture entitled: “The BP Gulf Oil Spill: What Happened?” Las Vegas, NV (11/8/12). · Invited talk to the Boys and Girls Club of Las Vegas entitled: “Fun with a Tesla Coil,” Las Vegas, NV (10/10/12). · Invited talk to Naval Air Weapons Station (NAWS) China Lake entitled: “Studies of energetic materials under extreme conditions and useful hard x-ray induced chemistry,” Ritchfield, CA (8/16/12). · Contributed talk to the High Pressure in Semiconductor Physics conference (HPSP-15) entitled: “High Pressure Studies of Aluminum Nitride,” 7/27/12, Montpellier, France. · Invited talk to Ms.Pam’s “Upper El” class at the Silver Sands Montessori Charter School for “Career Day” entitled: “The exciting world of physics and chemistry at extreme conditions,” 5/4/12, Henderson, NV. · Hosted a local Brownie Scout Troop to visit my laboratory on the UNLV campus 3/8/12 and discussed careers in physics for women. · Presented an invited poster entitled: “Development of Ion Beam Nuclear Transmutation Doping (IBNTD) for novel electronics in extreme conditions,” Fourth Integrated Symposium (UNLV/NSTec) Collaborative Research Opportunities, Las Vegas, NV (2/28/12). · Presented an invited poster entitled: “Development of IBNTD for novel electronics in extreme conditions,” at the University and Industry Technical Interchange (UITI) 2011 Review Meeting, Oakland, CA (12/6/11). · Invited talk to Francis H. Cortney Junior High School entitled: “The physics of speed,” Henderson, NV (11/29/11). · Invited talk to Cub Scout Troop #304 entitled: “The physics of sound” at the Sue H. Morrow Elementary School, Henderson, NV (10/11/11). · Invited talk to Ms. Jocelyn’s Bluebirds class at the Silver Sands Montessori Charter School entitled: “The physics of sound,” 9/14/11, Henderson, NV. · Two invited talks to Green Valley High School Students (Mr. Panik’s Physics courses): “Careers in Physics,” Henderson, NV, June 6, 2011. · Presented talk at the American Physical Society Meeting, Southern California-Nevada section meeting in Pasadena, California entitled: “A Far- and Mid-Infrared Study of HMX (octahydro- 1,3,5,7-tetranitro-1,3,5,7-tetrazocine) under High Pressure,” 10/29/10. · Presented poster at the DIAMOND 2010 conference in Budapest, Hungary entitled: “A High Pressure and High Temperature Study of Melamine,” 9/08/10. · Presented talk at the EHPRG 2010 meeting in Uppsala, Sweden entitled: “High pressure studies of explosives using a Paris-Edinburgh cell,” 7/27/10. · Presented poster at the Gordon Research Conference "Energetic Materials," in Tilton, NH entitled, "High pressure studies of HMX," 6/16/10. · Two invited talks to Green Valley High School Students (Mr. Panik’s Physics courses): “Careers in Physics,” and “High Pressure Physics” Henderson, NV, May 20, 2010. · Invited to teach/demonstrate the physics of sound to room six at the Montessori Visions Academy (Henderson, NV) 5/14/10. · Invited UNLV University Forum presentation: “UNLV University Forum presentation: “Practical Physics for Life in the 21st Century.” April 22nd, 2010. · Invited talk to Boulder City High School students (Mrs. Wiesenborn’s Physics class): “The exciting world of high pressure physics and chemistry,” Boulder City, NV, January 6, 2010. · Invited talk to the UNLV 2009 Academic Assessment Symposium entitled: "Developing Rubrics for Physics Courses," Las Vegas, NV 11/5/09. · Invited talk to the Challenges in Compression Science Workshop entitled: “Future Desired Directions in Static High Pressure Science,” Santa Fe, NM 9/24/09. · Presented poster at the EHPRG 2009 meeting in Paris, France entitled: “High Pressure X-ray Raman Spectroscopic Study of Melamine,” 9/110/9. · Presented poster at the AIRAPT 2009 meeting in Tokyo, Japan entitled: “Pressure-induced aromatization? High Pressure Studies of 1,3,5,7 cyclooctatetraene,” 7/30/09. · Invited talk to Los Alamos National Laboratory (DE-9) entitled: “Studies of hydrocarbons, energetic materials, and wide bandgap materials under extreme conditions,” Los Alamos, NM 7/22/09. · Two invited talks to Green Valley High School Students (Mr. Panik’s Physics courses): “Careers in Physics,” Henderson, NV, May 27, 2009. · Invited talk for the HiPSEC review: “Studies of hydrocarbons, energetic materials, and wide bandgap materials under extreme conditions,” Las Vegas, NV 5/11/09. · Invited talk to the Southern Nevada section of the American Association of Physics Teachers (SNAAPT) entitled: "The Large Hadron Collider at CERN: Determining the origins of our Universe" Las Vegas, NV, 10/3/08. · Contributed talk at the DIAMOND 2008 conference in Sitges, Spain entitled: "A novel method to dope diamond: ion beam nuclear transmutation doping (IBNTD)," 9/09/08. · Presented poster at the Gordon Research Conference "Research at High Pressure," in Biddeford, Maine entitled "High Pressure Studies of 1,3,5,7 Cyclooctatetraene: Experiment and Theory," 7/1/08. · Presented poster at the Gordon Research Conference "Energetic Materials," in Tilton, NH entitled, "Studies of triaminotrinitrobenzene under extreme static conditions," 6/17/08. · Two invited talks to Green Valley High School Students (Mr. Panik’s Physics courses): “Careers in Physics,” Henderson, NV, May 23, 2008. · Invited talk to the HiPSEC Annual Review entitled, “Bonding under extreme conditions,” May 20, 2008. · Invited talk to the MURI 2007 Review symposium entitled: “X-radiation damage in energetic materials under extreme conditions,” Aberdeen Proving Ground, September 27, 2007. · Presented talk at the AIRAPT 2007 conference entitled: "X-ray Raman Spectroscopic study of Benzene at High Pressure," Catania, Sicily, Tuesday, September 18, 2007. · Invited talk entitled: “Physics of Lighting and Tesla,” Illuminating Engineering Society, Las Vegas Section, September 11, 2007. · UNLV Physics Forum Talk: “Bonding under Extreme Conditions,” Friday, August 31, 2007. · KNPR interview: “Legacy of Tesla,” Friday, June 28, 2007. · Presented talk at the American Physical Society Shock Compression of Condensed Matter meeting in Hawaii entitled, “Radiation-induced damage studies of energetic materials,” Tuesday, June 26, 2007. · Invited UNLV University Forum Lecture talk entitled: “Nikola Tesla: Visionary Genius, Man of Mystery and Legend," Friday, May 4, 2007. · Invited talk entitled, “Radiation-induced decomposition in energetic materials," SMEC 2007 meeting, Miami FL, 4/17/07. · Presented talk at the American Physical Society March Meeting in Denver entitled, "High Pressure and High Temperature Decomposition Studies of PETN and TATB," Denver, CO, 3/7/07. · Two presented posters at the Diamond and Related Materials conference in Estoril, Portugal, September 3, 2006. · Presented poster entitled “Radiation- induced Decomposition of Explosives at Ambient and High Pressure” (Poster T-P157), American Crystallography Association Meeting, Honolulu, HI, July 25th, 2006. · Invited talk to the Energetic Materials/Insensitive Munitions Joint MURI Review, entitled: "Radiation Damage Studies of TATB and PETN," Army Research Laboratory, Aberdeen, MD, Wednesday, July 12, 2006. · Presented poster entitled: “Synchrotron radiation-induced decomposition of explosives at high pressure” at the Research at High Pressure Gordon Research Conference, June 25, 2006. · Presented poster entitled: “Radiation-induced Decomposition of PETN and TATB” at the Energetic Materials Gordon Research Conference, June 21, 2006. · Invited talk to the University of California, Berkeley Nuclear Engineering Department entitled: "Nuclear transmutation doping of wide band gap semiconductors and x-ray synchrotron studies of metals at high pressures," Monday, May 1, 2006. · Invited UNLV University Forum talk entitled: "Global Warming: Fact or Fiction," Thursday, April 27, 2006. · Presented talk at the American Physical Society March Meeting in Baltimore entitled, "X-ray diffraction study of elemental thulium to 86 GPa," Baltimore, MD, 3/15/06. Also presented a poster at the same meeting. · Invited talk entitled, “High Pressure Studies of Explosives and Metals,” East Carolina University, Greenville, NC, 3/12/06. · Invited talk entitled, “High Pressure Physics at UNLV,” Dine’ College, Tsaile Main Campus, Navajo Nation, Tsaile, Arizona, 11/7/05. · Invited talk entitled, “The World of High Pressure Physics,” to SAGE program students, UNLV Honors College, 8/3/05. · Invited talk entitled, “High Pressure studies of PETN,” MURI program Kick-off Meeting, Caltech, Pasadena, CA., Tuesday July 26, 2005. · Presented poster entitled “X-ray diffraction study of elemental erbium to 65 GPa” (Poster 358), and presented talk entitled, “High-Pressure Synchrotron Radiation X-ray Diffraction Studies of Pentaerythritol Tetranitrate C(CH2ONO2)4,”(Talk T2-O063), Joint 20th AIRAPT and 43rd EHPRG Conf. Proc., Karlsruhe, Germany, June 27th – July 1st, 2005. · Invited talk entitled, “Studies of phase transitions in PETN at high pressures," SMEC 2005 meeting, Miami FL, 4/22/05. · Invited talk entitled, "The Exciting World of High Pressure Physics," to the UNLV Honors College, Las Vegas, NV, 3/31/05. · Presented talk at the American Physical Society March Meeting in Los Angeles entitled, "High Pressure Studies of PETN up to 74 GPa," Los Angeles, CA, 3/21/05. · DOE NNSA/NV-UNLV Stockpile Stewardship Cooperative Program in Materials Science and Engineering 2004 Review - 1/12/05, "High Pressure Physics," Las Vegas, NV. · Invited talk to the Army Research Laboratory (ARL) entitled, “Optical Measurements of Thin Film Quantum Dot Sensors at High Pressures and Temperature,” Aberdeen Proving Ground, Maryland, January 5, 2005. · Invited UNLV University Forum talk entitled "The Great Contributions of Physics to Humanity," Monday, November 29, 2004. · Invited talk entitled "Direct Energy Conversion devices (DEC) using Ion Beam Nuclear Transmutation Doping (IBNTD)" delivered at Siltronics Inc., Portland, Oregon (10/15/04). · Presented poster at the International Union of Crystallography High Pressure Commission Workshop (IUCR2004) entitled: “High Pressure X-ray diffraction studies of PETN and Cyclohexane,” Saskatoon, Saskatchewan, Canada (8/18 – 8/21/04). · Presented poster at the Gordon Conference on High Pressure entitled: “Structural Studies of molecular and organic crystals under high pressure,” Meriden, NH (6/27 – 7/1/04). · Presented talk entitled "Direct Energy Conversion Devices utilizing wide band gap semiconductors and IBNTD," at the Naval Surface Warfare Center Carderock, Maryland (6/2/04). · Poster presented at " 2004 Stewardship Science Academic Alliances (SSAA) Program Symposium, "Albuquerque,NM, 3/30/04. · Presented talk at the American Physical Society March Meeting in Montreal entitled, "Raman and X-ray measurements on cyclohexane up to 40 GPa," Montreal, Quebec, 3/22/04. · Poster presented at "Future Directions for Multifunction RF Electronics Technology," joint DARPA/ONR-sponsored conference, Washington DC, 11/19/03. · DOE NNSA/NV-UNLV Stockpile Stewardship Cooperative Program in Materials Science and Engineering 2003 Review - 12/5/03, "Experiments at High Pressure," Las Vegas, NV. My wife, Dr. Maria Jerinic-Pravica is an Assistant Professor in Residence in the UNLV Honors College (http://honors.unlv.edu/). My wife and I were videotaped discussing our philosophies of teaching with James Rhem is an internationally-acclaimed expert on education: https://www.youtube.com/watch?v=_MqHnYRSaIE&feature=youtu.be . I am also a proud father. My kids’ websites: http://nicholas_pravica.tripod.com , http://nataliapravica.tripod.com , http://lukapravica.tripod.com. On hydroelectricity being “green” (sixth letter down): http://edmontonjournal.com/opinion/letters/tuesdays-letters-canada-a-safe-harbour-in-global-storms . On the recent discoveries and verification of gravitational waves: http://news.nationalpost.com/full-comment/letters-super-hornet-snafu . My talk entitled: “Tesla’s contributions to modern physics,” was placed on youtube: https://www.youtube.com/watch?v=ctSJH3KViJ8. On the need to support early education in mathematics: http://www.dailyherald.com/article/20130311/discuss/703119963/?interstitial=1 . This page was updated on 4/18/19.